... and we slide down deeper into the gutter by the day. You may see these efforts to counter the allegations as a dirty campaign against the Old Man, but those behind these posters think it is only fair to defend PM Najib Razak against the conspiracy to take him down. 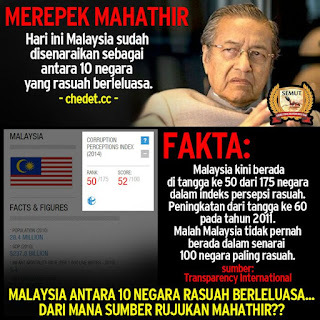 Tun Dr Mahathir Mohamad's people are not going to stop demonising Najib. Why, some of them have been preparing for this war for years. The PM's defenders aren't going to stop, either. Only Tun M and Najib can stop this from getting worse But what are the chances of that happening now? The war stops when Najib answers the simple questions asked. To the bootlickers - why is ringgit still cheap compared to SingDollar??? 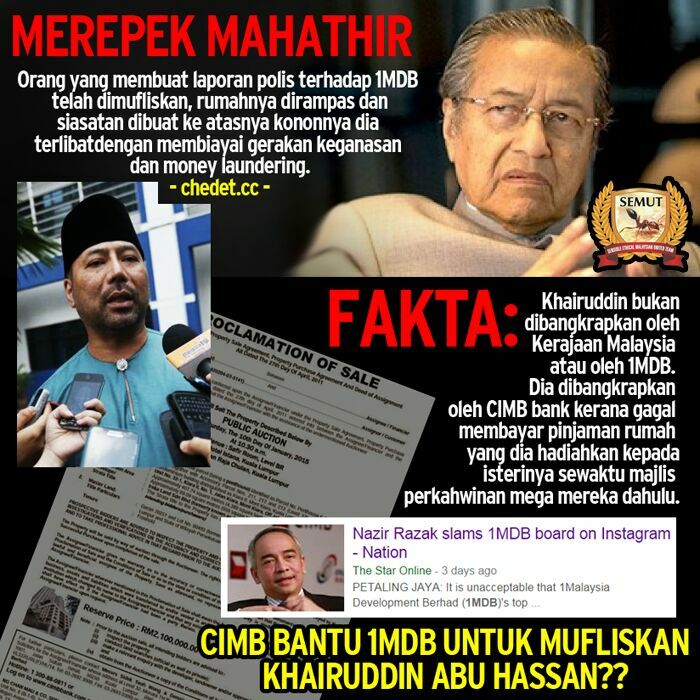 I rasa ia akan berterusan sampai PRU 14 dan kamu kena ingat disini tak ada istilah team mahathir atau orang mahathir kerana mereka tidak di upah macam najib dan kaki bodek nya , sekiranya berterusan pasti BN akan terlingkup disebabkan oleh najib dan jangan salah mahathir ,kerana sejak tahun lepas orang ramai dah mula muak dengan najib dan isterinya , mahathir mahu najib turun hanya semata mata nak elak dari umno terkubur itu saja tak ada agenda lain , jadi dengan terkuburnya umno mungkin mendatangkan kebaikan dimana parti ini boleh dicuci daripada mahluk mahluk perosak saya setuju dan bersedia untuk itu , kerana kalau PR memerintah pun ia takkan lama kerana apa berlaku di perak akan terjadi juga . Anyone trying to take on Tun by attacking him are just committing political suicide - because this is also a war of perception. I never was a political fan of Tun - but I respected him because he knew his direction and we all knew where he stood. He never seemed to care about being popular but had a good understanding of what the public mood was and how to ensure things moved in the direction of public perception. Najib and his people are so out of touch that they are just digging their own graves right now. It is Najib, rather, who has racked up a huge number of discrepancies, in between the prolonged bouts of silence (this has been dragging on for two years) which essentially tell the Malaysian public to go screw themselves. And now, Lim Kok Wing is being asked to polish a turd, PR-wise. If Tok Jib really wanted an old, incredibly ugly Chinese male to represent his interests, I believe Helen "AkuGreek" Ang would have cost a fraction of LKW's price. Her whining "what sort of people are they?" would have made the Mahathir camp back off, or at least die of boredom. Think about it, Dato' Seri. That's right Rocky, last year "The Economist" ranked Malaysia 3rd among the worst crony-capitalist nations of the world. Hong Kong came up tops and Singapore managed a 5th placing! if only they do the same regarding why suddenly money changes into 'units'. who is running this? some blogger? or official response? or some operatives just like what Eisenhower did for Cuba back in the 60s or someone did something to Yugoslavia in the 90s? the facts are never contested. and the reason given is to wait for the auditors to complete and someone in the government said there is no time frame given. It does not matter what our corruption ranking is, under Najib we KNOW that corruption is more rampant than ever. It has become so bad that even the government no longer realize BR1M is mass corruption, AES saman system is an extortion and 1MDB is robbery. We have become a pariah nation. Si Khairuddin yang kawin dengan artis tu nak jadi hero 1MDB? Buat melawak. alamak, now you againt mahthir hah? Knowing Tun M , it will never end until the objective are met . But then , knowing Nagib , the protege of Tun M , he will follow what the mentor tought him. In the Tun vs Najib fiasco, I sided Najib. Not because we really like Najib. But to bring down someone using baseless slander, perception, unverified news sources, spinning, personal attack, etc, is just unethical. Many are responding on behalf of Najib not because they like him. Most of these people (including me) has great respect for Tun. But facts are so open. People just simply cannot see (Singlish says bea tahan) such obvious injustice being inflicted against another person. At last all the deceits of the repugnant and avaricious half breed are beginning to emerge from the woodworks. I can bet my my life that a lot more, and I mean a lot more, will be revealed in the months ahead. That is unless the half breed will come up with some excuses to stop his relentless attack on Najib. I would not be at the least surprise of that especially knowing what wouldn't the half breed do just to avoid being indicted. After all over the 22 years' tenure as the PM, I must add to say that as a dictator and as a Lord of all he surveyed. He must have made or committed many, and I mean many errors and abuses and atrocities that no one was willing to come out in the open to reveal them. Everyone knows what is going to happen to them if they did, especially one must be prepared to face the ultimate consequences if they did. Here you are talking about dealing with the almighty who was even prepared to dismiss the Lord President of the judiciary and many others went to jail for disobeying the half bred dictator. Someone with who has a proven a track records of a tyranny. Unfortunately this repugnant ' chap chong' is so used being the dictator that he was that he has the illusion that he still has the same prerogative that he had to decide who the PM of Malaysia is going to be.He just doesn't realise this prerogative belongs to the people of Malaysia and in the election time. The sooner he realises that the sooner it will be for him., one thing he wants the people of Malaysia to know that he is going down without a fight. No doubt in the process he is revealing to the people the many 'dirty linens' of Umno and most of all enabling the Malaysians to have the chance a look at the skeletons hidden inside cupboard of Umno. What you are being told are not all that went on, they are just only the starters of a lot more to come ! Dato Rocky, stop skirting the issue. Its the issue of rm42b and where is the money. The lies and the corruption involved. When the repugnant and avaricious illegitimate charleskiwi rants, everyone belches.